Jacaranda acutifolia (NILI GULMOHAR) auct. non-Humb. & Bonpl. Synonym J. mimosifolia D. Don J. ovalifolia R. Br. Habitat Cultivated in Indian gardens. Action Leaves’ volatile oil—applied to buboes. Leaves and bark of the plant—used for syphilis and blennorrhagia. An infusion of the bark is employed as a lotion for ulcers. The leaves contain jacaranone, verbascoside and phenylacetic-beta-glucoside along with a glucose ester, jacaranose. be a strong inhibitor of prostaglandin biosynthesis in sheep. J. rhombifolia G. F. W. May., syn. gardens. Extracts of the plant show insecticidal properties. 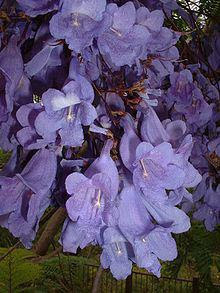 Several species of Jacaranda are used for syphilis in Brazil and other parts of South America under the names carobin, carabinha etc. A crystalline substance, carobin, besides resins, acids and caroba balsam, has been isolated from them.